Happy 8. birthday my queen Julchen!!!! 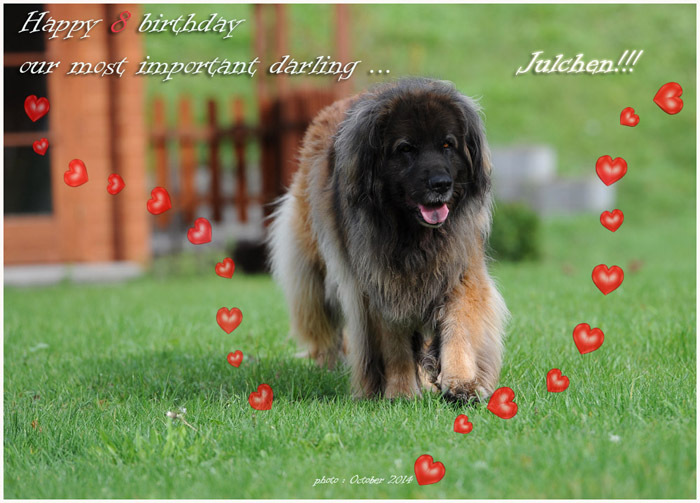 | Leonberger kennel " vom Vietingshof "
Happy 8. birthday my queen Julchen!!!! Happy 8. birthday my queen Julchen!!!! Wish me still many, many years together with you my bigest Love!!!!!!! There is no words to say how much I love this girl !!! Everything what I have I owe her and Jascha!!! Thank you my darlings!!!!!!!!!!!!! In eternally thankfulness for my two treasures to Eva & Dag Findahl and Heidi Slaash Johansen Stigberg!!!!!! !